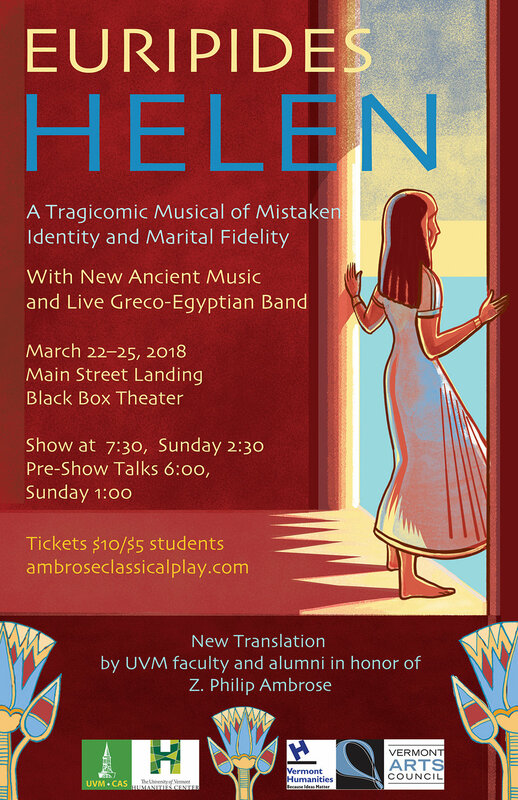 The week of March 20-25 is consumed by the production of Euripides' Helen at the Black Box Theatre at the Main Street Landing in Burlington, VT, and stars UVM students & affiliates. The show is a unique mix of pathos and comedy, with new music, dance, costumes, and my projected images. The play began with John (Franklin)'s idea to honor Phil Ambrose (professor emeritus) and his desire to compose music for ancient songs. Following the constraints of ancient rhythms and tunings, John creates songs that are both accurate to possiblilty and catchy. He had an electrified lyre made especially for the occasion by Creston Guitars. John and the other two musicians seem to be having a very good time with this music. John asked me to design the costumes, sets, and to create projections that accompany three of the songs. I hand-cut stencils and then painted trims that were sewn onto costumes for the chorus, Helen, Menelaos, the Dioscouri, and the orchestra. Rachel Cosgrove and very hard working student volunteers Zoe Anszperger, Eileen Parks, and Claire Wilcox made all the costumes with tremendous care and attention to detail. The inspiration for the costumes comes from Greek vase painting, Minoan wall paintings of Santorini, and Egyptian art. On stage there is a 4-foot high fence of lotus flowers and the one prop, a bench with hieroglyphs, that I painted in our garage. I created around 80 images that are projected while the chorus sings the three Stasimon songs. The effect of the chorus of seven women dancing and singing to a live band in front of the projections is magical--in a strange Ancient-Greece-in-Vermont kind of way! So many people have been involved in making this production happen--that alone is impressive for an extra-curricular event for all of us. Many thanks to everyone for making this show possible. Dan Bolles wrote an article for SevenDaysVT about the play.